I can't believe I'm back at the beginning again. I'm working really hard on quilting my unblogged quilt this week, as it's creating a bottle neck, with two tops now waiting behind it. Okay, I know there's people out there with cupboards full of UFOs but it's a new experience for me and somehow, I can't work out quite why, it makes me a bit uneasy. Not that I'm going to let that stop me though. So while I quilt like a mad woman I shall be contemplating the next piece I want to start, and to that end have been pulling fabrics from stash. I'm going back to Charley Harper - but different colours this time. I don't know which of these will make the final cut (so to speak!) but this is my starting point. It's always good to have a few things on the go and to ponder! Love the Charley Harper prints, I stashed some earlier this year and they remain uncut! ufo's happen because one follows the excitement. We are doing this for fun, right? no need to fret them, just enjoy all the making. LeeAnna at not afraid of color! Hi Kaja! 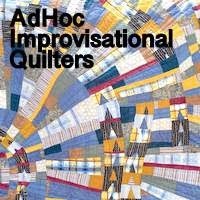 hope you are having a good time quilting. I have to learn more about Charlie Harper. i love that nuthatch fabric! Throw in some of that yellow-gold and you've got my vote! Woo!